What if there were anti-chemical suits that protected farmers from organophosphate pesticides, factory workers from accidental toxic releases and soldiers from chemical attacks? One Penn State research project is tackling this challenge and creating self-healing textiles that neutralize chemicals. A special coating process provides self-healing textiles with their chemical repelling abilities; textiles are dipped in a series of liquids that form into a polyelectrolyte layer-by-layer coating. 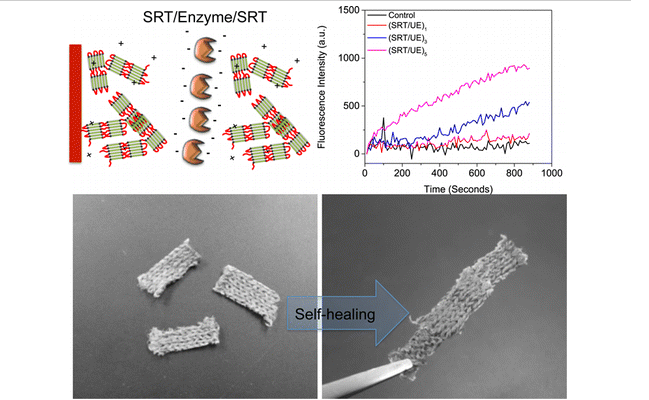 Researchers in the ACS Applied Materials & Interfaces journal said that the coating is applied, “Under ambient conditions in safe solvents, such as water, at low cost using simple equipment amenable to scale-up.” Negatively and positively charged polymers make up the polyelectrolyte coatings found in self-healing textiles. Enzymes can be incorporated into the coating during the layering process. Researchers used a urea-breaking enzyme called urease for the project, but in commercial products, the special coating would contain enzymes that matched targeted chemicals. “If you need to use enzymes for biological or chemical effects, you can have an encapsulated enzyme with self-healing properties degrade the toxin before it reaches the skin,” said Demirel. Today, the skin can absorb many toxic substances regardless of working conditions. Self-healing textiles with anti-chemical enzymes could protect people from dangerous exposure. The squid teeth polymers found in self-healing textiles are still efficient in water conditions, too. Garments with this special defense would also be reusable, since laundering repairs micro and macro coating defects. Self-healing textiles may be new to the apparel market, but they could soon play a crucial role in consumers’ lives. The question is, would you willing to replace your mattress protector if it has self-healing ability?